Today AMD is launching its strongest assault on the High-End Enthusiast Desktop segment since the Quad FX platform back in 2006. AMD’s Ryzen Threadripper is an aptly named product that marries the performance of two Zepplin dies inside of the same physical package that AMD’s EPYC server chips use. Compared to AMD’s existing Summit Ridge products and their top SKU, the Ryzen 7 1800X, the new Ryzen Threadripper 1950X offers twice as many of everything. The 1950X doubles the number of CPU cores, doubles the amount of cache, doubles the number of silicon dies, doubles the PCI-E lanes, doubles the memory channels, and finally doubles the TDP. Technically and conceptually one could easily think of Ryzen Threadripper as the dual socket version of Ryzen. But that would ignore the tiny and significant detail that Ryzen Threadripper is packaged as a giant single socket chip. Because AMD’s Ryzen Threadripper’s share the same physical package as AMD’s EPYC server chips, under that massive heat spreader there’s space for up to four Zepplin dies. With 1950X AMD is only putting two dies on the chip and then adding two die sized spacers where the other two dies would have gone. This means Ryzen Threadripper has an abnormally large amount of surface area for dissipating heat. AMD is also only using the top 5 percent of Zepplin dies in their Threadripper chips. These facts coupled with a massive 180 Watt TDP, have enabled AMD’s product designers to do something interesting. The 1950X actually offers XFR boost clocks of up 4.2 Ghz on four cores while the 1800X is limited to 4.1 Ghz on two cores. The outcome is that Ryzen Threadripper can offer the same or slightly better single and lightly threaded performance as AMD’s best Ryzen 7 chips. This is an impressive feat all on its own, but it looks even better given Intel’s stumbling start with the Core i9/Skylake-X lineup that competes directly with AMD’s new Ryzen Threadrippers. AMD is once again turning up the heat on Intel. With the issues of the early X299 platform largely resolved, Intel’s Skylake-X chips stand ready to do battle with AMD’s 12 and 16 core Threadrippers. In this review we’ll be comparing AMD’s top Ryzen Threadripper SKU to Intel’s best Core i9 chip the i9-7900X. This match up may seem a bit unbalanced at first because Intel’s i9-7900X is only a 10 core chip. But it’s priced at $1060 where as AMD’s 1950X is a cool $1000. Given the similarity in cost between these two chips I believe it’s reasonable to compare them. AMD’s Ryzen Threadripper 1950X is a 16 core chip with 32 threads on two dies both in a fully enabled 4+4 core configuration. Like all of the Ryzen 7 chips there are 512 KBs of L2 cache per core for a total of 8 MBs and 16 MBs of L3 cache per die for a total of 32 MBs. Combined the 1950X has 40 MBs of cache at its disposal. It’s base frequency is 3.4 Ghz, all core boost is 3.7 Ghz, 4 core boost frequency is 4 Ghz, and 4 core boost with XFR is 4.2 Ghz. Like all Ryzen Threadripper chips the 1950X has 4 memory channels with ECC support and the same 2666Mhz DDR4 memory limit as the rest of the Ryzen family. In AMD’s internal tests they were running the higher DDR4 3200Mhz memory speed without issue. In this review we’ll also be running the memory on our 1950X test bench at DDR4-3200. Technically the Ryzen Threadripper platform supports up to 2 TBs of RAM. But but but, you’ll need to use nonexistent large-capacity UDIMMs and a Linux-based OS. Window 10 Pro is limited to 512 GBs of RAM and Home edition is limited to a mere 128 GBs. It also has 64 PCIe Gen3 lanes. Four of those lanes are reserved for talking to the X399 chipset. Up to 7 PCI-E devices can be connected using up to 60 lanes at any given time. To scale to more PCI-E devices the motherboard must have an external PCIe clkgen device. AMD suggests running 3 GPUs on x16 links and then hooking up 4 NVMe x4 drives if you care about storage. Or going for 6 GPUs on x8 links and a single NVMe x4 drive if you care about raw GPU compute. Thanks to the flexibility of the X399 platform you can plug-in pretty much whatever you want if you can find a slot for it. Speaking of the platform with Ryzen Threadripper AMD is introducing a new socket called socketTR4, sTR4, or just TR4. Whatever name you use for this socket it’s a physically massive LGA design with 4096 pins. 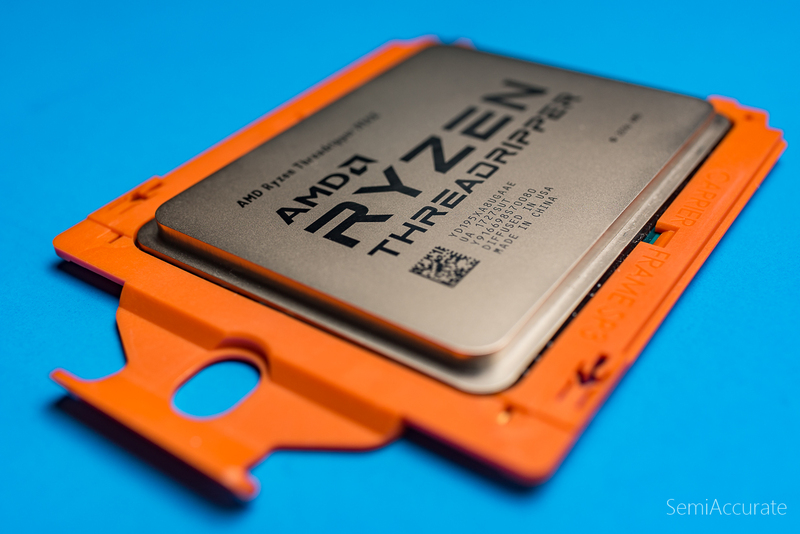 Every boxed Ryzen Threadripper chip ships with an adapter that screws into the four mounting points on this socket and allows you to mount any Asetek manufactured closed loop water cooler. Asetek is the ODM behind watercoolers for brands including EVGA, Corsair, and Thermaltake. Back on the 3rd AMD allowed reviewers to post how-to content on installing a Ryzen Threadripper chip into a sTR4 motherboard. If you have a minute, check those videos out, because unlike Intel and AMD’s traditional sockets you can’t just plop a Threadripper chip into the socket and synch it down. Rather you need to use the T20 star drive torque limited screw driver that AMD’s included in the Threadripper box alongside the water cooler adapter. Then you’ll have to unscrew the three screws that hold the socket’s retainer plate to the motherboard in the correct order. From there the retention plate will lift up and hinge towards the bottom of the socket. On top of the pins sits a small mounting frame that has two metal tabs at the top of the socket that you’ll need to lift up on to release it. Here’s where things get really strange: Ryzen Threadripper chips are permanently attached to a bright orange carrier frame. This hard plastic frame is not designed to be removable and it stays attached to the chip inside the socket even after you’ve slotted it into the mounting frame. Rather than placing your Threadripper directly onto the pins of the socket you need to slide it into the mounting frame and then lower the mounting frame down onto the socket until it clicks into place. From there you can use the torque-limited screw driver to reverse the rest of the process. The first time you install a Threadripper chip is a bit of trip. But by the time you get the second and third go around it’s no slower than installing a chip into any other socket. AMD is taking an interesting tact by pitching the Ryzen Threadripper as the perfect chip for people that want to play games while they wait for their videos to finish encoding or their model to finish rendering. I for one can’t think of what else you could possibly do with all these cores. So credit to AMD for understanding what their target market is. 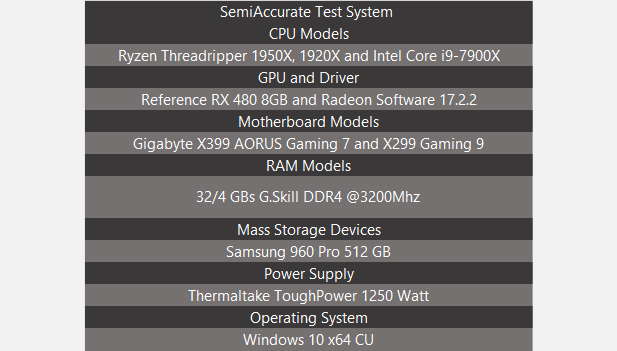 But Threadripper and Intel’s Core i9 part share the same basic issue: gaming performance doesn’t scale with core count; rather its scales with clock-speed, memory latency, and occasionally cache sizes. AMD is doing its best to work around this issue by offering XFR clock rates that are higher than what you can find on Ryzen 7 chips and Intel for its part is using its Turbo Boost Max Technology to offer boosted states of up to 4.5 Ghz on it Skylake-X chips. Needless to say Intel has a bit of a single threaded performance advantage here on the extreme high-end of the market. AMD’s Threadripper is handicapped by Ryzen’s inability to clock higher than the low 4.x GHz range and its lower per core performance. Intel’s Skylake-X chips can clock higher and offer better performance per clock. But for now, Intel’s chips can’t match AMD’s raw core count. At the end of the day, if gaming is your primary concern, neither AMD’s Threadripper or Intel’s Skylake-X are the right chip for you. But they are also no worse than their cheaper siblings. You’re not gaining anything for gaming, but you’re not losing anything either. For our testing today we used Gigabyte’s AORUS Gaming 7 which is the only X399 motherboard Gigabyte is offering at this time. This motherboard is nearly an exact copy of the X299 version, which should be unsurprising to most given that these two platforms address the same market niche and are launching at nearly the same time. Our thanks goes out to Gigabyte for providing us with this motherboard and AMD for sending the rest of the components used in this review. First up let’s see who can assert dominance at the $1000 price point. In our single threaded testing the i9-7900X has the lead by any where from 16 to 32 percent. This is a pretty commanding advantage for Intel; although it’s worth noting that the 1950X’s performance is still very good. 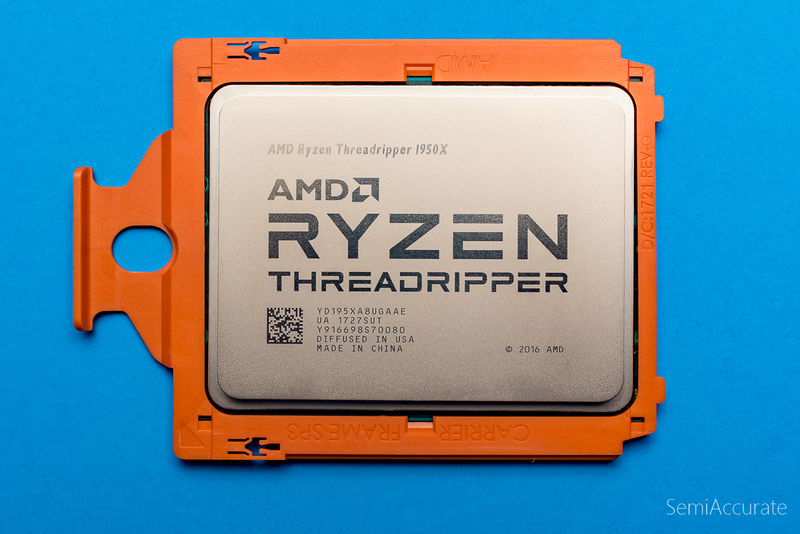 In our multithreaded testing AMD’s Threadripper pulls ahead thanks to its higher core count. Although Intel’s i9-7900X is able to offer similar performance in many scenarios thanks to its higher per core performance. In gaming workloads performance is very similar between these two chips. Looking at power consumption we can see that the 1950X draws a bit more juice in gaming scenarios, but is more efficient in our rendering workload. Just as with AMD’s other Ryzen chips Intel maintains a performance per watt lead in idle and lightly-threaded scenarios. 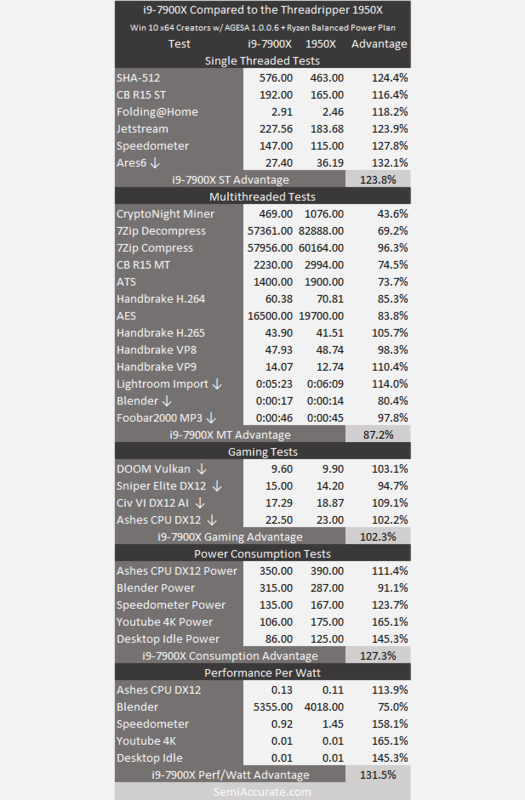 It’s worth pointing out that out CryptoNight miner benchmark sees the Threadripper 1950X as two separate chips. The number in our tables reflects the total score for the test system which runs to instances of CryptoNight at the same time. AMD is aware of this behavior where some apps will recognize the topology of Threadripper and respond to it in weird ways. Certain games for example will not run on CPUs with too many threads. To address this issue AMD has updated its Ryzen Master overclocking app to give Threadripper owners the ability to disable one of the two dies on their chip from inside of Windows. AMD calls this option legacy compability mode. You can also adjust how Threadripper presents is memory system to the OS by switching between a latency optimized “local” mode and a throughput optimized “distributed” mode. Essentially AMD is giving users the choice between a NUMA and a UMA memory configuration. I for one think that’s all pretty neat. 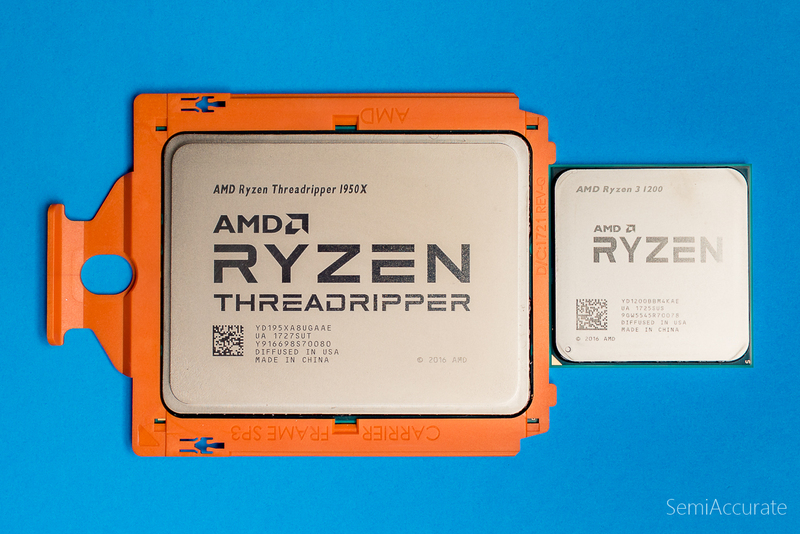 What happens when we match the Ryzen Threadripper 1950X up against its little brother the 12 core 1920X? As the raw specs would suggest, single threaded performance is identical between these two Threadrippers. In multithreaded performance the 1950X establishes a clear lead over the 1920X. 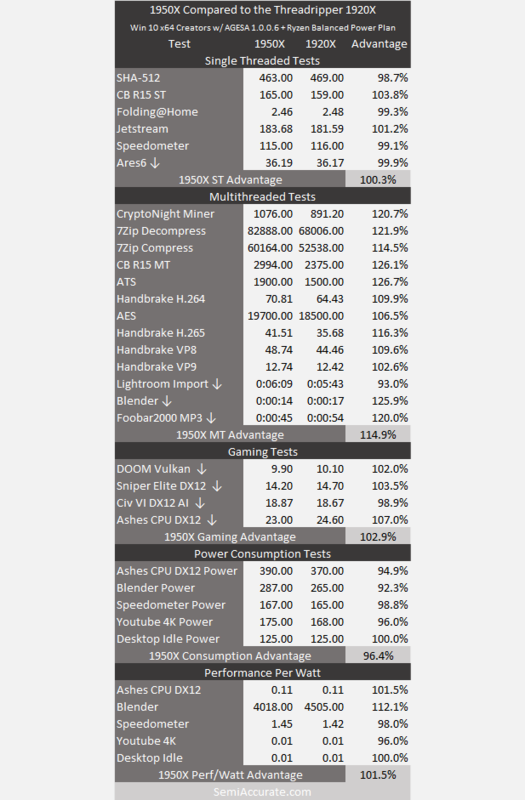 Gaming performance and performance per watt are basically the same while the 1920X draw a few less watts from the wall.